In this day and age, what is a heretic, how do we recognize one, and from what are they to be rejected? Heresy was a major problem in the early years of the beginning of the church. It also became a problem during the Protestant Reformation. The battle between heresy and orthodoxy is not destined to end anytime soon before the Lord returns. 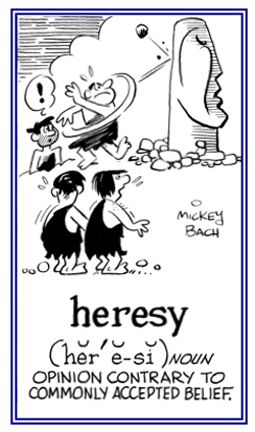 Heresy is any belief or theory that is strongly at variance with established beliefs or customs. A heretic is a proponent of such claims or beliefs. Heresy is distinct from both apostasy, which is the explicit renunciation of one's religion, principles or cause, and blasphemy, which is an impious utterance or action concerning God or sacred things. If we take the definition as it stands, then we can see that in its simplest form, a person who believes in sprinkling for water baptism is a heretic to one who believes in immersion. Or, one who believes in the Rapture is a heretic to one who does not. It is not wrong to hold such differences. Neither the one nor the other is dangerous to the Body of Christ. However, holding to one or the other in such a way as to cause division within the body, the local assembly, certainly is and must be dealt with. During the height of the Charismatic Renewal I had many a pastor tell me that tongues divided their church. As I probed a little more deeply, however, I found that it was not tongues that divided, but people's attitude that brought division. Paul's admonition comes on the heels of telling us to not get entangled in a war of words. And therein lies a clue as to how to recognize a heretic. How do we Recognize a Heretic? We are able to recognize a heretical person when that one will not consider the unity in the body more important than their own particular brand of interpretation. There was a recent example of this in my own local assembly less than two weeks ago as I write this. This is someone who cherished her particular belief more than the unity of the body and was not willing to subject herself to a very mild admonition. It was not her doctrine that was divisive, but the way she held that doctrine. In that place, she was being heretical. From what are they to be Rejected? Fortunately, it was not necessary to reject her as she took the initiative and rejected us. It is still sad, though, that such a thing had to happen at all. There should have been an openness to sit down at some convenient time and discuss the belief that was being challenged. Do you have that willingness? Will you hold your peace on something that is challenged until such a time as cooler heads can prevail and the matter can be discussed in a civil and loving manner? As a leader, are you willing to challenge something that is “not quite right” in such a way that a discussion will be possible? Or, do you automatically and immediately cut it off? If the ensuing discussion is fruitless in that nothing changes, then the person so challenged is to be rejected. The Amish practice of “shunning” is probably the best example of putting Paul’s admonition into a practical application. Note that nothing is said nor implied about telling them they are not welcome anymore. They may still show up for church gatherings, but they soon realize they are no longer a part of that gathering. They are simply shunned. No one talks to them. No one sits at table with them. No one asks them how they’re doing. They are treated neither nicely nor meanly. They are simply ignored. The goal, of course, is their restoration. If they desire the fellowship of the assembly, they will eventually ask how they may be restored. This doesn’t work so well in our modern church setup where someone can simply “take their ball and go home.” They can easily go to another fellowship and begin again. Since individual church leaders are more concerned with keeping their church full than in keeping it pure, there is no accountability among the pastors as they compete for people in the pews. Thank you, Andrew; I appreciate that.